Manchester United manager Jose Mourinho has reportedly ordered the club to tie wonderkid Tahith Chong down to a new contract after being impressed by him in training. 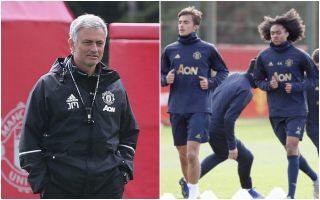 The 18-year-old has recently made it into the club’s first-team picture a little more after being given the chance to train with the senior side and even make the bench for the Champions League tie against Juventus on Tuesday. Chong has long been rated as a top talent coming through at Old Trafford and the Metro now claim he’s sufficiently impressed Mourinho to earn a new deal on a potentially huge pay rise. The report states the teenage winger currently earns £2,000 a week and could see his wages go up to as high as £20,000 a week – a pay rise of 900%. United fans love seeing young talent coming through at their club, with the Red Devils having a proud history of promoting from within. Mourinho himself has not always shown so much faith in young players in his career, often seeming to prefer to look to the transfer market for big names and experienced pros to fix his teams’ issues. Chong, however, must be a pretty special talent to have made such an impression on the Portuguese in a relatively short space of time, with the Metro citing his professional attitude in training as winning over the manager.